Department of the Interior Secretarial Order 3336, Rangeland Fire Prevention, Management, and Restoration, called for the development of a comprehensive, science-based strategy to reduce the threat of large-scale rangeland fire to greater sage-grouse habitat and the sagebrush steppe ecosystem. In response to the Secretarial Order, the Department of the Interior released the Integrated Rangeland Fire Management Strategy in summer 2015. The Strategy describes a three-pronged approach. First, develop strong land management plans for federal lands. Second, implement conservation measures on state and private lands. Finally, create an effective strategy to address the threat of rangeland fire. 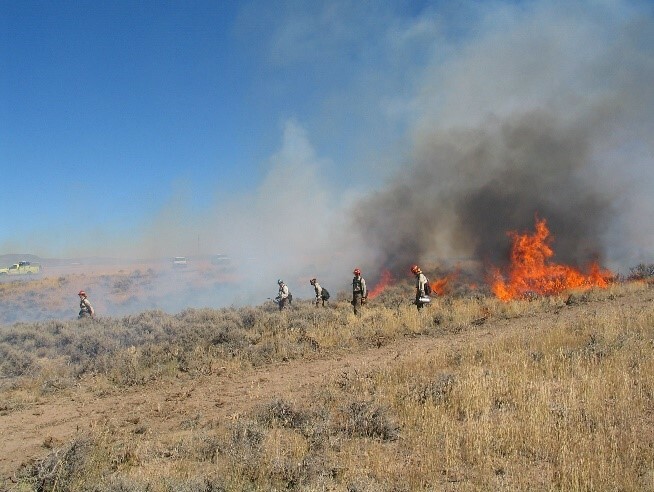 Within this approach, the Strategy describes actions that federal and state wildland fire managers and their partners can take to prevent and suppress rangeland fires while enhancing the conservation and restoration of the sagebrush-steppe. In September 2016, the four LCCs of the sagebrush steppe co-hosted a presentation on the scientific tools and methods developed to support the implementation of the conservation strategy. Watch a recording of the webinar and view the presentation slides. The Great Basin LCC is supporting work related to several action items from the Strategy. The Great Basin LCC played an integral role in creating the Integrated Rangeland Fire Management Strategy Actionable Science Plan. The Science Plan will serve as an action-oriented blueprint for acquiring scientific information to support the Strategy. It identifies 37 priority science needs that address knowledge gaps in five topic areas: fire, invasive plants, restoration, sagebrush and greater sage-grouse, and climate and weather. Great Basin LCC Coordinator, Rick Kearney, and former Science Coordinator, Todd Hopkins, served on the writing team for the science plan. Matt Germino, Great Basin LCC Research Ecologist, also contributed content. Additionally, the Department of Interior identified the Great Basin LCC as a primary source of science for the Strategy. Working with the Great Basin Fire Science Exchange and other partners, the Great Basin LCC has supported the development of an easily accessible online source of science-based tools, information and resources for managers across the Great Basin. The site serves as a portal to access summaries of work completed to date, links to data collected or generated under the Strategy and other resources. It will be updated with additional information as it is made available. Identifying available funding sources to support the action plan and implement new research in 2017 and beyond. The Integrated Rangeland Fire Management Strategy will help guide federal, state and local priorities for years to come. The Great Basin LCC is proud to have a prominent role in this important program.